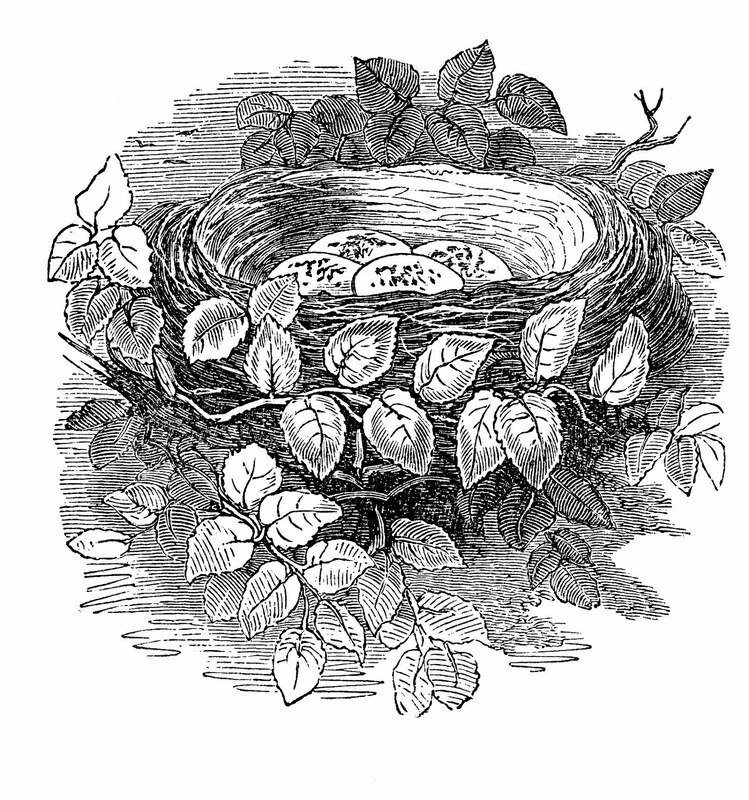 This splendid engraved Bird’s nest with eggs image comes from the most amazing book! In fact I do believe it’s currently THE most amazing book in my collection, but that’s all I’m going to tell you today, more on that tomorrow because I have some other exciting news to share with you today! So here it is. Today I’m being spotlighted… interview and all, by a wonderful new site called The Blog Guidebook. Now I know what you are thinking. You’re thinking “geez Karen another interview, how many times are you going to make us read about you!”. haha But here’s the thing, it’s a fabulous new site and a wonderful resource for anyone that blogs, or is thinking about blogging. It really is worth checking out! And besides, there’s a bribe involved! Yes that’s right, I’m now resorting to bribing my readers to read interviews about me! 1) Leave a comment here on this post and tell me the name of one of your favorite images here on The Graphics Fairy. 2) Pop on over to the The Blog Guidebook and leave a comment there as well. You might just walk away with a $25 Gift Card to Michael’s Crafts. And you know you need some craft supplies! CLOSED – Thank you to all that participated!!! I love the Eiffel Tower image you posted this week! It’s perfect for tons of crafts! Thanks for making the offer of a giveaway. I love nearly all the images you post and my favorite so far is this bee – GF beebumble-graphicsfairy002d. I always put GF in front of your images so I can keep them in one collection on my Macs. I keep hoping to cross the ‘big pond’, the Potomac!, and come see your shop. One day. Fairy Whispers is one of my favorites – I’m using it for water bottle labels at a fairy tea this summer. Good Morning! Thanks for the nest graphic..hmm..I would guess that my favourite image from you is the mermaid shield one..love mermaids! Congrats! My favorite of your images are the French labels. Most of them I have no idea what to do with, but I just enjoy sitting & looking at them. You are so amazing! I look forward to your posts each day. I’ve loved the blank labels (most recently the French one), any type of wreath and of course, anything with birds/nests! Pick a favorite? You’ve got to be kidding! LOL! I do always tend to go to the Children’s Illustrated Books clips, mostly because I’m an education and find them so interesting and reflecting on what education use to be. So any of those make my day. I do thank you for all the time and effort you put into this blog. You get an A+! I became a follower of yours yesterday when I added one of your backgrounds to my blog. Thank you. 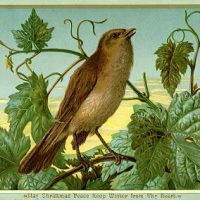 I love the nest image you posted today, since I have a bird in my blog title I love to look for bird images. The image you have on “Blog Guidebook” took my breath away when I saw it. I have recently started following them as well, as I am new to blogging and need all the help I can get! Thank you again for all the lovely images you so freely share. I love the Antique Fern botanical print and it’s mate! I’m planning on transferring them onto canvas for our guest bathroom! There are so many images I use, but this is the one I keep coming back to. I have been using Robin, the one that sits on a little twig on a blank background. Love this image so much. I thank you for it. Please add me to your give-away. Thanks again! Robin! I love your mermaids by the sea. I love the rooster image you posted last week and can hardly wait to use it! Great giveaway! I like the vintage bone images. They are fun to use at Halloween. Dress Forms and Sewing Machines is one of my favorites but there are so many images that I love I can’t say that it’s my most favorite cause I have about a hundred. You do so much for all of us, Thanks a Whole Bunch! Asking for a favorite is so not FAIR! 😉 but I am especially fond of the French perfume labels; the black/ivory and gold one is particularly fine. My fav images are the dress forms and sewing machines – sorry I couldn’t pick just one. 😉 Thanks for this opp!! Good to see that you are being recognized! Thanks for always having great graphics, but my favorite is the Halloween kind of lady with the bat wings, and the Crown Diamonds!! Love those for crown making. My favorite so far is the woman’s silhouette against a turquoise background, with ‘Arthur L. Brown’ on it. Of course I could use a gift card to Michaels! : ) My favorite image is the Cacao French girl. I love that image because it reminds me of my daughter when she was a little girl. I absolutely ADORED the Eiffel Tower one you posted just recently! I love the birds and nature images. I also like the patriotic and seasonal ones. Its hard to pick one favourite, but I do love the Superb Dove with Moon and Stars, and have been using it as my desktop for quite a while now. I can’t decide which image is my favorite–I love the Lion Brand Coffee image and the bumblebees plus A LOT of others….including the bird’s nest! I have to pick just one???? Ummmm….love the Eiffel Tower this week….and huge urn with flowers! So OK, I’m picking TWO! I love all the Victorian ladies and fashions!! I cant pick just one, they are all so great! Thank you so much for the graphics! I like all the roosters. Your blog is one of my favorites out there. But I believe one of my favorites is “Patriotic Girl”. The old photo of the little girl with flag. Heading over to the other link to post my comment. Hi Karen, I visit daily and have saved many of your images to use. My favorites are bird related. I love how you give both the original and a cleaned up version on some so that we can use them in different ways. I like how you ID your graphics so that it easy to credit your site as well. Thanks always! my favorite is the egg print. I love the baseball pictures, I have used them for a few projects so far…thanks again! I love them all but I think my favorite is the eiffel Tower postcard from very recent days! Okay! Okay! I am leaving comments everywhere! haha! But it is true I love your images, especially the Man or woman in the Moon! Then thee are all the eggs I adore! Plus fairies, crowns and any old ephemera you got lying around! The image I like is this, Free Vintage Clip Art – Paris Advertising Ephemera, I think you can do many jobs with them. I would like to participate in your give away. Already published on my blog and I visit The Blog Guidebook. A big kiss and thanks for all your pictures! La imagen que mas me gusta es esta ;Free Vintage Clip Art – Paris Advertising Ephemera, creo que se pueden hacer infinidad de trabajos con ellos. Quisiera participar a tu give away. Ya lo publico en mi blog y voy a visitar The Blog Guidebook. Un beso grande y gracias por todas tus imagenes!!! Oh, this is so not fair! Okay I will say Mushroom Red … but I also love the Roses on the blue background .. which is actually from your background blog (I made tape out of it!) Love all your images! I just cannot name just one! I am loving all the vintage labels! Thanks you for your wonderful library of vintage images! While this was NOT an easy one the birdvireofairy004- the little yellow arm and hammer vireo bird is my fave. the detail on the feathers sent me racing across the street to my husband (who was in the park with the kiddies) copy in hand sooooo excited to show him. I love this! The antique Eiffel Tower postcard shown on June 7th was “tres magnifique”! I can’t say that I have just one favorite. I love the silhouetts and french items you post. Thank you so much for posting such great things for all of us to use in projects. One of my favorites is one of the botanicals (002b?). Kind of a viburnum type flower. Lovely! I love your blog! Thanks so much for all you do and share! Hi Karen its so hard to choose a favourite image, as you have so many fab ones on your site. I especially love the vintage photos and have used one favourite ‘Funny Baby in a Bowl’ on both a New Baby and a Baptism card adding an amusing caption – the recipients loved them! Thank you so much for bringing all these images to us! 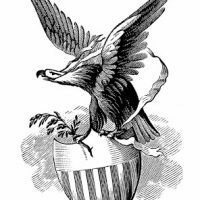 The image of a bird ‘etching’ is my absolute favorite. I’ve actually had to tell myself I’m not allowed to use it anymore (for now…) because it ends up in so many of my projects! I love all the birds and nests. This one today is lovely. ok….so here i am just opening email and i get one from the blog guidebook…i see there is a giveaway….eyes pop open and i think, hmmmm, i’ll just pop over to that interesting looking place and enter….ok so now it’s ONE HOUR LATER and i am still just drooling over all those beautiful bird images i have hunted for to make a transfer for a little burlap bucket i have been working on! how fun! i downloaded several birds and of course the nest and eggs but think i shall use the little one of a bird with a little border to his left…love it and thanks for the giveway opportunity…love this blog! You had these adorable chickie not too long ago. They are jus adorable. Have is said adorable? I loved the Language of Flowers, including the ripped page it was on… just stunning! Thanks for all you do. This site tickles me pink. I love all of the holiday images, because I love to make things to give away to family and friends. My favorite that I used over and over this year was the antique santa with moon, it was perfect for the men in my life! Always enjoy the pen flourishes–thanks for the giveaway! I love the french ephemera, especially the labels, they are so beautiful. I use them often in my digital art work. You are the best! My favorite graphic lately is a black and white (etched?) lemon and branch print. Right now I am loving all things lemon! Oh there are so many, its hard to choose one! The one I have used most and probably my fave would be the simple spoon one that one of your readers requested. I love that one. I adore anything French… especially the Eiffel Tower you posted this week. My absolutely favorite image was the one of Jesus that was done with one stroke of the pen that you posted for the Easter weekend. Just looking at it is amazing! Thank you for sharing it and thank you for a wonderful blog with so much information that has helped me with crafting again! “The Poetry of Flowers Urn” is SOOOOOOOO beautiful – It took my breath away! What is more beautiful than flowers and poetry? I had to add this to my collection of AMAZING Graphic Fairy items. Thank you for all you do to bring beauty and joy for us to use and see every day and to evoke ideas and expose us to other incredible artists.I truly appreciate the effort and look forward to what will be posted next. My favorite Graphics so far are the Shakespearean ones…. of the heroines. Love them! Its hard to pick a favorite when I drool over all the images you provide! I am always inspired by you. I love the bird images you’ve given us. They have led me down the path a many crafty creations. Thanks for the giveaway! the valentines day post from this year. The young couple in love. Love that! Hi Karen~ ~ ~Congrats on the interview. I’ll gladly read an interview by you gal! Off to do that now. Oh, yes favorite you must be kidding. I adore the French Ads any of them and the bird nests. I seriously cannot choose a favorite. I do especially love all the bird images though! 🙂 Thanks for all your posts! Thanks for this link to a great new site – very interesting. Very difficult to choose a favourite among all your great images, but I love the Parisian store ad for ‘Gouffe’. I was playing around with it for a project I hope to put on your Brag Monday this week. This is hard – I love checking out your site and seeing what new images you have, a constant source of delight! If I had to choose, though I think I’d go with the vintage paper dolls. darling so cute in my office. Karen–I love the French perfume labels! Thanks for the bird´s nest, gorgeous image – and that´s the point, I love all your vintage stuff!!! Quite hard to say which is my favourite, maybe the bumble bee… or the cakes. But I love them all! I was born in France so I am very partial to the Eiffle Tower. One day soon I will go back to my home country to visit. Your images make me very happy. I must say that I love coming here and seeing all the wonderful images you have. I love any of the vintage label images the best, although I’d be hard pressed to find one I didn’t like! I appreciate so many of your images; however, so appreciated your taking the time to put up tickets in THREE colors. Hi Karen, my favourite image is the ‘Amazing Ballerina’ and I particularly love the jewellery stand project, posted in a Brag Monday recently. Have visited the new blog, made a comment and signed up to follow as well! I love all the bird-related images most of all. But seriously, they are all great! I really like “the amazing ballerina”- I love her face. I’ve had a lot of fun with the ticket you posted a couple of weeks ago. The birds and butterflies…can’t choose which one is best! First off, I love this site. Your blog is my favorite. I agree the tickets you posted are great; but my favorite have been the Little Red Riding Hood clips from old books that you have posted. Thanks for all you do for us crafters. Oooh! Please enter me! I have left a comment on the Blog Guidebook site. 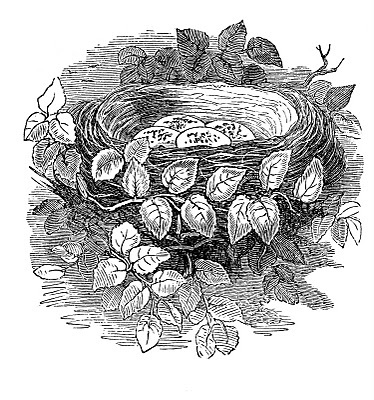 My very favorite graphic of yours is the Victorian clip art bird with nest & eggs (the robin). Thanks! I love too many of your images to choose one favorite! One that I use and am always drawn to is the French Roses Postcard! Oh so many images, but I’m drawn to the pen & ink ones, and love the Nest with Eggs. When I start a blog (soon I hope) I would like to use it as part of the header. I love them all but the black and whites and the intricate designs are my favs! I love almost all the labels too.Thanks for all your hard work. Congrats Karen on your blog being featured…you really deserve this because you are so giving here to us all in blog land 😀 My favorite images from your site are of victorian women and architectual elements. My favorite is the peas in the pod, on that cute antique label, thanks for a great give-away! Blog guidebook did a great interview! I always enjoy reading your interviews – so glad you post and let me know about them. My fave image . . .there is so many. I love all of them really – but this is the link to my current favorite. I am currently working away with this image involved, and promise to share soon as I finish. Thanks again for all you do!! where is the fairy whispers? It would be impossible to pick just one! I LOVE all of the images you post! The flowers and the French ones are my favorites! I plan to use several this week alone! too many nice ones – love birds though! Wow that is hard to do but today my fave image is the Girl with dog, doll and stocking it has everything I love notall but granddaughter dogs and Christmas ! Thanks so much for your wonderful graphics! Love the gorgeous ballerina sisters and all the French themed images. Your blog is such a great resource for crafters. Thanks for supplying us with all those great images! It’s too hard to pick just one. I love the birds and nests and advertising images. Thank you so much for sharing with us. I love all the vintage labels you post. I love the birds you post… I can’t pick a favorite, I’m afraid, there are just too many amazing images! I use them to make wrapping papers for soap, and for other little gifts to give my Auntie, who adores all things bird! Gosh Karen, you don’t want much, our favorite??? That’s impossible. I do love the old see catalog images. I also love the children during Christmas, which I print out onto sticky back canvas and put on chipboard and add to my Christmas cards. The same process is used for the images from the seed catalogs. I am just so glad I found this website, it makes my cards so special and one of a kind!!!! I don’t know where I’ve been, but this was the first article I’ve read about you. Very interesting. Its fun to try to win something–so thanks for the opportunity. My favorite images to actually download and use are the black & white ones. I color them for card-making. I enjoy seeing all the vintage images though!! The English garden plan images were just what I needed on the wall in my family room! They’re in nice black frames next to a wall sconce with ball candles. The house goes on the market on Sunday. Thanks for the perfect touch, Karen! I love so many of your images and just started following you today! But the one that brought me here was your two rabbits and a kitten riding a scooter! Love it and so many more!! Thanks Jan K.
My favorite image is the Crown Diamonds sheet music. I have used it for my logo for my line of products that I’m working on for my Etsy shop. I can’t pick one fav … love so many … birds, flowers, vintage advertising, ANYTHING from Paris! I’m taking an e-course with Kelly Rae Roberts and I mentioned your blogs as an amazing source for other artists and bloggers in the class. My favorites are anything having to do with birds. My favorite was the Irish lad that said “Top of the Morning to You”. I saw an awesome vintage-looking plaque at Hobby Lobby before St. Pat’s day, but couldn’t justify buying it, and the next day you posted that image and I determined I would make a little wooden plaque of it! Now I just have to find the wood to decopage it onto. I LOVE the Lovely Bird and Nest Engraving. I must have a bird fetish because I love wrens and peacocks as well. But of anything vintage appeals to me:) Fun site! I’m such a fan of vintage ephemera. Thank you for sharing your images, especially any of the Eiffel Tower – my fav is the one posted this week. I love the images of flowers! wow, that is asking a lot…to choose ONE!!! I’ll go with Antique end paper!! Love so many I have gotten here. I love your immages, especially the vintage wallpaper, such as 1wallpaperbl002.jpg. Good for backgrounds for the greeting cards I make. Thanks for making them available. Pick just ONE?!? It’s difficult, but I’ll pick “A Picturesque Gothic Cottage” from last October. I used it a lot for Halloween. Really though I love every one of your images and enjoy your blog so much. Thanks! What a great giveaway for all of us who love to create! One of my favs is the ballet sisters image. Hi Karen, I love all of your images, but I particularly love the old photographs. Old photos are so powerful the way they evoke a simpler place and time. Just gorgeous. I visit you most days. well you don’t have to bribe me, I love your blog! But I surely wouldn’t mind that gift card either! My favorite image that comes to mind is ophelia. I think it is just so romantic and I love it. Love the vintage dress froms and sewing images. What a lovely engraving! Thank you for sharing it. I love Spencerian Saturdays, but my favorite day to read your blog is Thursdays when people ask for the wacky things …and you have them! as I adore bees, my favorite image is also GF beebumble-graphicsfairy002d. Ooh I just love your blog and it’s so exciting that you’re doing a giveaway! I have so many favorites but right now my absolute most favorite has to be the quilting ladies old photograph.